Truckee's Sean Kelly stands atop the podium in Reno after winning the Northern Nevada High School Weight Competition on Friday, May 25. When it comes to feats of strength, few athletes in the region can produce the kind of output as Truckee’s Sean Kelly. The junior finished out his 2017-18 athletic campaign by outlifting athletes from the Reno-Sparks area for first place at the Northern Nevada High School Weight Competition. The Wolverines sent several athletes to Reno High School on May 25 to compete in the meet, which involved squat, bench, and power clean. Kelly, who was one of eight Wolverines football players to rush for more than 190 yards last season, outlifted the field of competitors in the 205-pound division by 40 pounds, finishing the day with a total of 1,035 pounds to top Manogue’s Gilberto Aguilera. The Wolverines running back and free safety was dubbed the strongest 205-pounder in Northern Nevada after the competition and also earned lifter of the meet honors. Kelly power-cleaned the most weight of any competitor in the division, driving up 315 pounds, which equals a Truckee school record. He also had the heaviest bench press of the day at 315 pounds. The two lifts gave him enough of an edge to top Aguilera, who squatted 440 pounds compared to Kelly’s 405. Truckee junior Brennen Conklin was seventh in the division with a total of 620 pounds. Junior Chance Bordner competed in squat and lifted 405 pounds. Senior Dominic Acevedo claimed fifth in the 185-pound division with 855 combined pounds. Junior Zach Charter was 16th in the class with 705 total pounds. Junior Jackson Skaff also competed by didn’t register a score after three unsuccessful squat attempts. Skaff had highs in bench at 285 pounds and power clean at 255 pounds. Junior Alex Freeman finished 10th in the 165-pound division with a combined 750 pounds. Fellow junior Kevin Malo, who averaged 8.0 yards per carry last season, took 12th in the division with 715 total pounds. 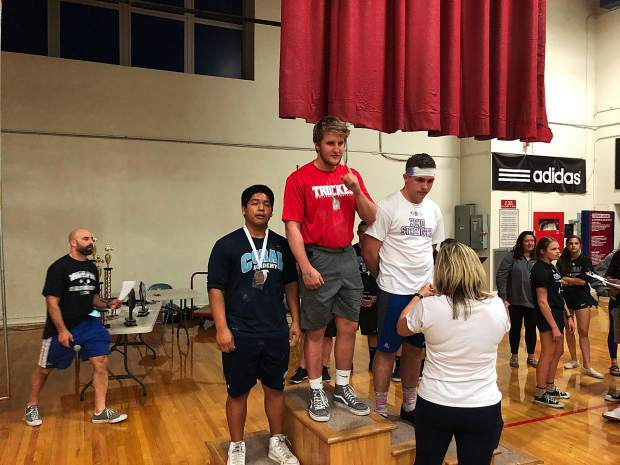 Truckee freshman Micah Ivens also competed at the event and took ninth in the junior varsity 165-pound division with a total of 675 pounds. Freshman James Hogarth was 16th in the division at a combined 565 pounds. Freshmen Finn Loper (690 pounds) and Zak Kuch (480 pounds) also competed in the division. The Truckee football team is hosting its annual lift-a-thon fundraiser on Wednesday, June 6, in order to raise funds for the upcoming season. As of Thursday, May 31, the team has raised more than $18,000. To donate to Truckee’s upcoming season visit wefund4u.com/truckeelift18/sms/45301/. The lift-a-thon will begin at 6 p.m. in the old gym. The football team also opened up spring practices last week and recently announced the 2018 schedule. Truckee will open the season with a league game against rival Fernley due to the Nevada Interscholastic Activities Association moving the fall season up a week, which created a scheduling conflict for the program. Truckee will also see a new league opponent this season, with the addition of Reno school, North Valleys, to Class 3A. North Valleys played in Class 4A last year, but after going 1-8, successfully petitioned the activities association to move down to the Class 3A level. Truckee kicks off the 2018 season at home against the Vaqueros on Aug. 18.